Near the end of February 1888, Hurlbert witnessed an eviction on the Winn (Wynn) estate in Glenbehy (Glenbeigh), County Kerry. The date, 22 February, was George Washington’s birthday. The American reporter suggested the “stern old Virginian landlord” would be amazed at the “elaborate preparations” required to evict a tenant in Ireland. In 1886 and 1887, Sir Redvers Buller, special police commissioner, and Father Thomas Quilter, parish priest, negotiated new lease agreements between the landlord and about 70 tenants on the estate. Only a handful of the tenants paid the reduced rents they agreed, however, either because of pressure from the National League or because they were too poor. In turn, the authorities burned and leveled numerous houses to prevent re-entry by evicted tenants who did not meet their new rent obligations. 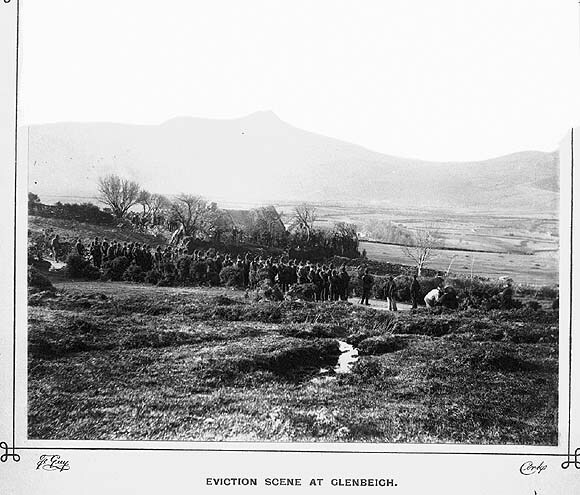 Period newspaper illustration of 1887 Glenbeigh evictions. Hurlbert contended that because of the subscription fund and “despite, or because, of the two evictions through which he has passed,” James Griffin was “very well off” with “a very good horse and cart, and seven or eight head of cattle.” He remained 240 pounds in arrears. On the five mile hike to the Griffin house, Hurlbert joined other “gentlemen of the Press” in addition to about 50 police and troops deployed for the eviction. The group passed Winn’s Folly, “a modern medieval castle of considerable size” that no one ever lived in except as a temporary police barrack. It remains a tourist curiosity. After we passed the castle we began to hear the blowing of rude horns from time to time on the distant hills. These were signals to the people of our approach, and gave quite the air of an invasion to our expedition. We passed the burned cottages of last year just before reaching Mr. Griffin’s house … [As the eviction began] there was no attempt at a resistance, and but for the martial aspect of the forces, and an occasional blast of a horn from the hills, or the curious noise made from time to time by a small concourse of people, chiefly women, assembled on the slope of an adjoining tenancy, the proceedings were as dull as a parish meeting. Troops on their way to an eviction in Glenbeigh, County Kerry, circa 1888-1890. The Eblana Photograph Collection, National Library of Ireland. The scene got a little tense when Father Quilter tried to pass through the police cordon to deliver a telegram, the contents of which Hurlbert did not reveal in his narrative. “A squad of men” was put in charge of the house to prevent re-entry and “the rest of the army reformed for the march back” to the scattered boos and groans of the bystander tenants, Hurlbert observed. “I shall be curious to see whether the story of this affair can possible be worked up into a thrilling narrative,” he wrote. I will explore Irish press coverage of the eviction that Hurlbert witnessed in the next post. NOTES: From pages 196 to 214 of Ireland Under Coercion: The Diary of an American. This entry was posted in History, IUC, Revisted and tagged County Kerry, Eviction, Glenbeigh, Winn's Folly on March 22, 2018 by admin. Mark, this is a very interesting description of the Glenbeigh evictions. I have read and written about it myself, but never read a description before from ‘the other side’ as it were. My interpretation would have come from the nationalist side, land league side. It makes for more chilling reading actually – Hulbert seems to have relished the prospect of the altercation and of course he was well protected by police and baliffs.